Chromatic Aberration is a film installation which explores the early technologies of colour filmmaking drawn from the archives of George Eastman House, Rochester, New York. 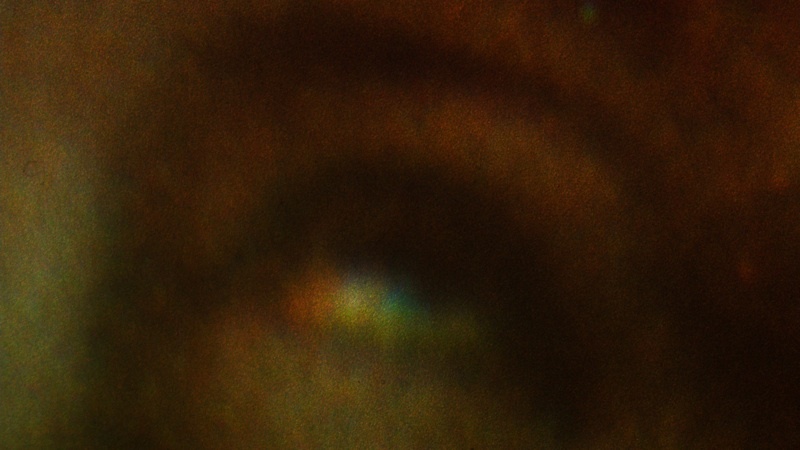 Featuring vibrant close-ups of eyes from fledgling archival experiments in colour film, Chromatic Aberration turns the cinematic lens in on itself: from the prosthetic recording eye of the camera, to an evocation of the abstract inner screen of one's eyelids. Early 1920s colour film footage - mainly tests shots featuring members of George Eastman's family as well as Hollywood stars of the time - is shot in such a way so as to reveal the inherent chromatic fringing, distortion and misalignment. 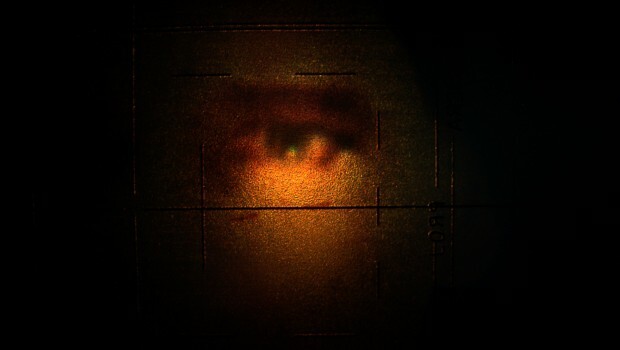 Using specialist equipment at the BFI National Archive, London, the footage is reworked through the use of extreme close-up and magnification, honing in on the eyes. The installation evokes an imagined abstract colour world, a flickering eyelid trapped in a mechanical peephole. Exhibitions: Solo exhibition as film installation at Tyneside Cinema (Newcastle, Oct-Nov 2014); Solo exhibition at George Eastman Museum (Rochester, New York, Jan-April 2015), including a second work on display; solo exhibition at Clifford Gallery (Hamilton, New York, Oct 2016). Film festivals - nominations for competitions: Winner of Best Vanguard Film Competition in Lima Independiente International Film Festival (Peru). Nominations: Filmadrid festival (Spain); Curtas Vila do Conde film festival (Portugal); Festival du Nouveau Cinema (Canada); Jihlava International Documentary Film Festival (Czech Republic ); International Film Festival Bratislava (Slovenia). Additional screenings at International Rotterdam Film Festival (Netherlands); European Media Art Festival (Germany); BFI London Film Festival (UK); Mini-retrospective screening at DIM CINEMA, The Cinematheque (Vancouver May 2015). Reviews and interviews in Artforum, The Wire Magazine, After Image, Studio International. Public lectures: with Prof. Sarah Street at Tyneside Cinema (Nov 2014); Royal Academy visiting public lecture (Nov 2014); ‘The Laughter of Things’ symposium, International Film Festival Rotterdam and Piet Zwart Institute (Rotterdam Jan 2015); George Eastman Museum and Rochester University (Rochester NY April 2015); Colgate University (Hamilton, NY Oct 2016). Acquired by the George Eastman Museum for their collection.